Ageing is a regulated process in which hormones have pivotal roles. Crystal structures of two hormone co-receptors should be informative for drug discovery focused on age-related disorders. Makoto Kuro-o is in the Division of Anti-Ageing Medicine, Center for Molecular Medicine, Jichi Medical University, Shimotsuke, Tochigi 329-0498, Japan. In Greek mythology, three goddesses known as the Fates govern the lifespan of each person. Klotho, Lachesis and Atropos are the spinner, the allotter and the cutter of the thread of life, respectively. So when a genetic mutation was identified in mice that undergo premature ageing1, the gene involved was fittingly named klotho. The protein it encodes, α-klotho, and a sister protein called β-klotho, are high-affinity co-receptors for certain members of the fibroblast growth factor (FGF) family of signalling proteins2, but their means of action has not been well characterized. Two papers3,4 online in Nature describe crystal structures of FGF–klotho complexes, not only providing a basis for understanding how klothos act, but also opening up avenues for structure-based drug design. α-Klotho is a membrane-spanning protein expressed predominantly in the kidney, as well as in the brain. Mice lacking α-klotho exhibit a range of signs associated with ageing, including hearing loss, impaired cognition and organ atrophy5. They also have elevated blood phosphate levels. However, the protein’s function on the molecular level was unclear, until mice lacking FGF23 were characterized6. FGF23 is one of the three endocrine FGFs, which act as hormones, secreted by one organ to regulate the function of another. Specifically, FGF23 is secreted from bones after phosphate intake and acts in the kidney to inhibit phosphate reabsorption in urine, thereby maintaining the body’s phosphate balance. Mice lacking FGF23 have elevated phosphate levels owing to impaired phosphate excretion, and exhibit features associated with ageing6. This striking similarity to mice lacking α-klotho led researchers to discover2 that α-klotho forms a complex with the membrane-spanning protein FGF receptor 1c (FGFR1c), acting as a co-receptor to recruit FGF23 and so triggering FGF signalling. In the first of the current studies, Chen et al.3 solved the crystal structure of FGF23 in complex with the ligand-binding domain of FGFR1c and the extracellular domain of α-klotho. 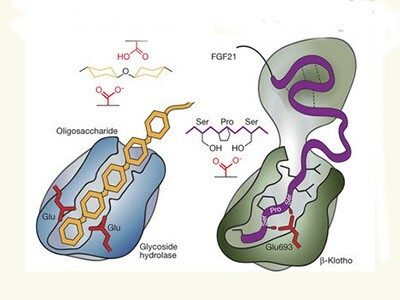 The structure revealed that α-klotho (aptly, given its namesake) sends out a long receptor-binding arm (RBA) that acts as a thread to capture the ligand-binding domain of FGFR1c. Indeed, when the authors generated α-klotho lacking the RBA, the mutant protein failed to capture FGFR1c or to help FGF23 to activate FGF signalling. Chen and colleagues showed that FGF23 fits into the groove created between α-klotho and FGFR1c. The globular amino-terminal region and the rod-like carboxy-terminal region of FGF23 face FGFR1c and α-klotho, respectively (Fig. 1). By promoting formation of this complex, α-klotho enables strong interactions between FGF23 and FGFR1c, which otherwise interact only weakly. Figure 1 | Structures reveal the mode of action for klotho proteins. Two groups3,4 have produced crystal structures of the extracellular domains of klotho proteins, either alone, in complex with ‘endocrine’ fibroblast growth factors (FGFs), or in complex with both endocrine FGFs and the ligand-binding domains of FGF receptors (FGFRs). As this simplified schematic shows, the klotho proteins seem to have an intrinsically disordered receptor-binding arm (RBA) with which they capture FGFRs (interaction indicated by double-headed arrow). The RBA enables formation of a stable complex, with FGFs fitting into the groove between the other two proteins. Like α-klotho, β-klotho functions as a co-receptor for endocrine FGFs, forming a complex with FGFR1c to bind FGF21, and with FGFR4 to bind FGF197,8. FGF19 is secreted from the intestine after feeding, and acts in the liver to suppress bile-acid synthesis. FGF21 is secreted from the liver following fasting, and acts in fat cells and the brain to induce metabolic adaptation to fasting and responses to stress5. Although FGFRs are expressed in a wide range of tissues, the tissue-specific expression of β-klotho in the liver, fat and brain restricts the target organs of these endocrine FGFs. In the second study, Lee et al.4 resolved the crystal structure of β-klotho’s extracellular domain when bound to and when free from FGF21, in the absence of FGFRs. Like FGF23, the C-terminal region of FGF21 fits into the groove in β-klotho. However, the authors could not solve the structure of some regions in β-klotho, including that corresponding to the RBA in α-klotho. This suggests that the RBAs of klotho proteins are intrinsically disordered and unable to fold stably unless bound to FGFRs. The fact that intrinsically disordered proteins can interact with multiple proteins9 implies that the RBAs of klotho proteins could capture other partners besides FGFRs. This might explain why the extracellular domain of α-klotho, which can be released into the extracellular space, has been reported to have FGF-independent activity, regulating several ion channels and transporters, along with other growth factors and their receptors5. Another proposed FGF-independent activity for the klothos is as carbohydrate-binding proteins called lectins. Klothos belong to a family of enzymes that cut sugar chains1, but not all of the amino-acid residues essential for this enzymatic activity are found in the klothos. Thus, klothos might bind to, but not cut, specific carbohydrates. Lee and colleagues’ structure of β-klotho leaves open the possibility that this protein interacts with particular sugar chains. 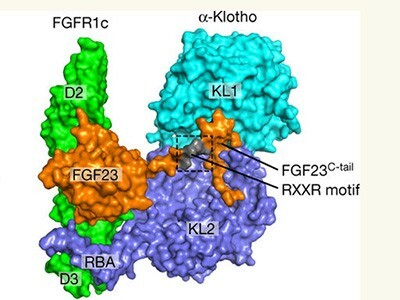 By contrast, Chen and co-workers’ structure of FGF23–α-klotho–FGFR does not fit with the idea of α-klotho acting as either an enzyme or a lectin. However, it might be that in the absence of FGFRs, the structure of α-klotho would provide a different point of view. Alternatively, it is possible that the two klothos have different FGF-independent activities. FGF–klotho signalling has key roles in ageing and age-related disorders. The new structures could be used to develop drugs to treat disorders of ageing, using structure-based drug design to identify targets in FGF–klotho–FGFR complexes. For instance, consider chronic kidney disease (CKD)5,10 — a common state of impaired renal function that often occurs as a complication of high blood pressure or diabetes. People with CKD exhibit many of the same symptoms as mice lacking α-klotho, including disturbed phosphate metabolism and increased risk of death5,10. Placing mice lacking FGF23 or α-klotho on a low-phosphate diet reduces the phosphate retention and premature ageing normally seen in these animals, indicating that phosphate increases accelerate ageing10. Thus, drugs that target FGF–klotho–FGFR complexes to improve phosphate metabolism might be useful to treat CKD. A second example lies in the targeting of FGF21 complexes. FGF21 overexpression extends lifespan in mice11, and this protein has been dubbed an ‘anti-ageing’ hormone. Lee et al. demonstrated that they could increase the potency of FGF21 by introducing genetic mutations designed to increase the protein’s affinity for β-klotho. Further analyses such as this could provide a way to explore anti-ageing medicines more generally. Kuro-o, M. et al. Nature 390, 45–51 (1997). Kurosu, H. et al. J. Biol. Chem. 281, 6120–6123 (2006). Chen, G. et al. Nature 553, 461–466 (2018). Lee, S. et al. Nature 553, 501–505 (2018). Hu, M. C., Shiizake, K., Kuro-o, M. & Moe, O. W. Annu. Rev. Physiol. 75, 503–533 (2013). Shimada, T. et al. J. Clin. Invest. 113, 561–568 (2004). Ogawa, Y. et al. Proc. Natl Acad. Sci. USA 104, 7432–7437 (2007). Kurosu, H. et al. J. Biol. Chem. 282, 26687–26695 (2007). Wright, P. E. & Dyson, H. J. J. Mol. Biol. 293, 321–331 (1999). Kuro-o, M. Nature Rev. Nephrol. 9, 650–660 (2013). Zhang, Y. et al. eLife 1, e00065 (2012).